Live Links for more information and services. 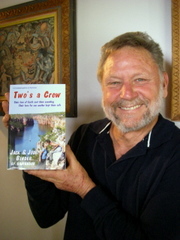 Personally reconnoitered by Jack and Jude with additional anchorages by gulf experts John and Inara. We’ve been sailing since we were kids and have safely explored untold scary places. So rest assured, if you follow our lead, you too will have the experience of a lifetime with the caveat that you’re in command and that sailing the seas is a life threatening passion. Select your desired format by clicking on the appropriate Buy Now, which will bring up a secure payment system using MasterCard, Visa, direct debit or PayPal. Immediately after payment is made a link will be presented to download your file. Also an email will be sent to your PayPal email account with payment confirmation and duplicate link. These links expire after 24 hours and allow 5 attempts to download. Contact us if there’s a problem. KINDLEs: The secret to uploading any file to a kindle is to know where the file is on your computer, and then plug in the kindle using the USB cable. It will then be recognized as just another device like a thumb drive or camera. Using your file manager (Explore in windows) copy and then paste the file into the “documents” folder listed under your kindle. Once you see your file in that”documents” folder, when you turn on the kindle it will show up with all your other books. Therefore the secret is to download our Cruising Guide to a location that you can find, like “My Documents” or Win 7 uses “downloads_net” which is a folder under “My Documents. iPhones and iPods are a bit easier, especially if you download our file straight from the device. But on some devices, Google Play have tightened their grip, making it harder to access downloaded files. On our Android, we use a free app “Cool Reader” that reads multiple formats and will browse to any file on our device. A good reader for ipads/ipods is here. As you can imagine, this project has taken a bit of dedication and hundreds of hours, so all we ask is that you respect our copyright and do not replicate or distribute our files. Instead send your mates here to buy us a wine. Cheers. 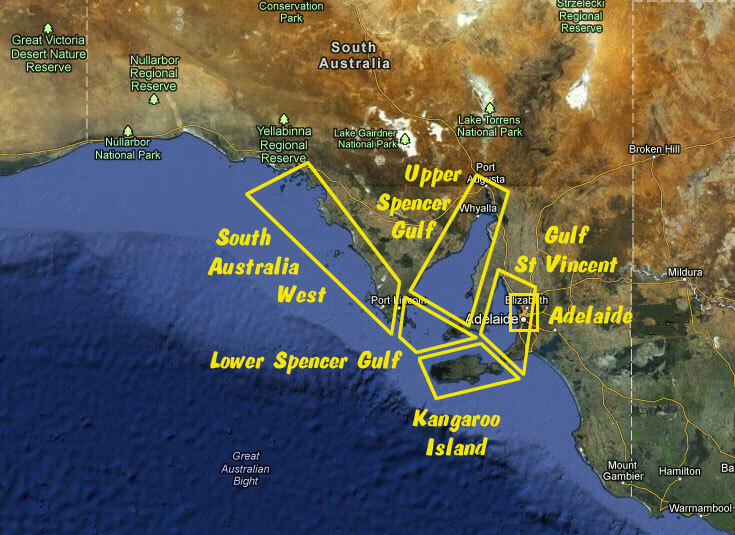 Has anyone found tidal stream charts for south Australian coast, not much info on charts what does everyone else use. The BOM has a sea temperature and currents page for SA here. There’s a page for every state, particularly useful for the East Australian Current. 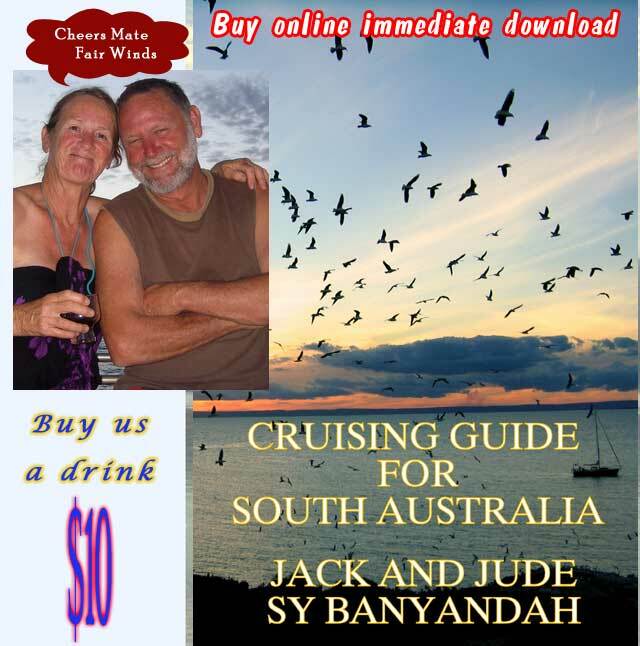 Hi Jack and Jude, we are on our second world circumnavigation on Scotia and this time around we are considering sailing the bottom of Australia, calling in at Tasmania, Perth then on to Sumatara, Malaysia. We are having difficulty finding relevant info for Southern Australia. So far we have discovered that the best time would be January to March and that light winds may be expected. Lots of harbours, good weather forecasts. We just wondered if you had any further advice or info, or tell us where to find it. ie is it in your book. PS: We are in NZ just now and sailing for Fiji in a few days. Good idea, the summer winds are perfect to sail east to west under Australia. Only problem, there’s never enough time to see it all! Tasmania has a ton of special places especially if you like it wild. Tassie’s east coast is drier and more settled, it’s south coast can be hostile or wonderful depending on the weather and the west coast, well, there are really just two places but each has a lot of very interesting, well protected anchorages. Either study our online guide or chip in $5 and get yourself an Electronic guide for your laptop or Ipad. I’d probably hit Hobart, check in, then you you have a choice either run north to the Furneaux Group then across the top to Three Hummocks and King Island, or alternatively down the channel and across the bottom to Port Davey and wilderness, then Macquarie Harbour, small town, history and the Gordon River, navigable for 20 miles, then choose your way to either three hummocks or King island. I’d Miss out on Victoria, you’ll be travelling too fast. Head instead straight to Kangaroo Island in SA. there are many anchorages in both gulfs, all free, small towns, cheap eating and good wine. Adelaide is definitely worth a visit. need to pay there. Probably at the CYC in the river. there are several choices. Same advice as before, study our online guide to SA or buy us a beer and get the Electronic guide, looks real good on an Ipad. In the summer the winds near the coast are easterly – and can be strong, reaching 30 knots in the afternoon and evening. Mornings can be quiet but once the heat gets going the wind comes with it. Our guides covers all the way to Albany in WA. Best place there, in our opinion is Oyster Harbour, although there is now a marina right at the end of main street, and that’s convenient. Going up the west coast in winter will give you offshore SE winds and take away the risk of cyclones. 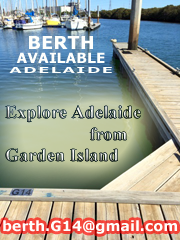 Check out in Dampier or Broome and your off to Asia. Hi i have a farm on lake Alexandrina and looking for a sailboat at the moment. Also doing research as to where to tie up overnight as planing trip up the Murray. Do you have lower lakes and Murray info? Sorry Dietmar, we have no information on the Murray. “SA’s Waters, An Atlas and Guide” has the Murray, alas only in print.